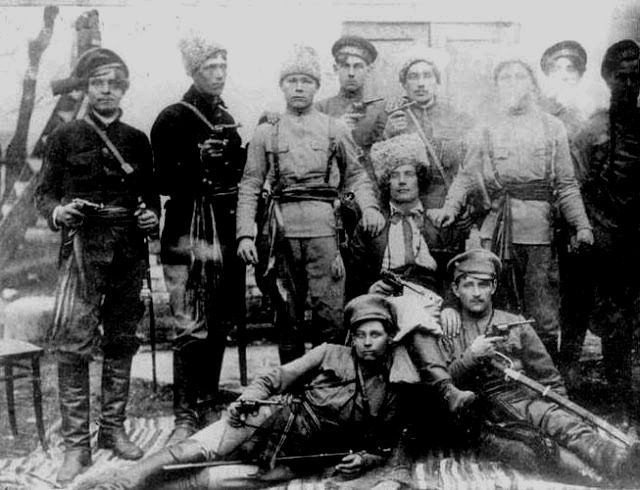 Just wanted to say this is an excellent article, and doesn't have the same pitfall as a few texts on the Makhnovists in that it links extensively to external sources including documentary evidence. It also picks apart very well the relationship between Makhno and Ukrainian nationalism. The charge of him being a Ukrainian nationalist is often thrown about by Trotskyists. One thing I didn't know before was that Makhno didn't even speak Ukrainian, but only spoke Russian! Shubin is an excellent source for all things Makhno. The picture on this page incorrectly identifies the central sitting figure as Makhno. It is, in fact, Fedir Shchus'. Also regarding Makhno's language, I believe it is not a clear cut case. It is true that Makhno expressed frustration that he was unable to write his memoirs in Ukrainian, but I do not think this indicates he only understood Russian. What we understand as Ukrainian and Russian today are standardized languages often forced upon communities, quite recently in history, through the educational system. This is similar to German, where standard High German has come to define the language over dialects like Bavarian, Swabian, etc. Before this standardization, the different regions spoke dialects. The particular Steppe Ukrainian dialect around Gulyai-Pole was what is called a surzhyk, combining grammatical and vocabulary characteristics of both Ukrainian and Russian. While the large cities like Alexandrovsk [Zaporozhzhia] and Ekaterinoslav [Dnipro] primarily spoke Russian, the rural areas had a much stronger Ukrainian influence. Makhno would have certainly been educated in Russian but I find it hard to believe he didn't speak the indigenous dialect. However, it is fair to say he did not speak what we understand today as standard Ukrainian. Anarchism and syndicalism in the colonial and postcolonial world, 1870-1940 : the praxis of national liberation, internationalism, and social revolution / edited by Steven Hirsch, Lucien van der Walt. (Leiden, 2010), pp. 147-191. This work is found in the libcom library. Thanks for the additional info Sean, apologies that was my mistake, the hat threw me!